Commercial patio furniture is often an over-looked option for homeowners. There’s nothing worse than spending cold hard cash for products that only last a few years before needing replaced. Sometimes buying commercial grade products can make more sense when trying to eliminate the need to constantly replace certain items around a home. Outdoor and patio furniture are expensive and easily broken so, they qualify as such an item. The constant exposure to sunlight, wind, rain and snow can quickly take its toll on metal and untreated wood products. Although pressure treat wood has very good weathering resistance, it still requires regular staining or painting to maintain its appearance. With time in short supply for most people these days, that can make it a less appealing option. Some metal patio furniture has decent weathering abilities but its very heavy, is susceptible to chipping of paint causing rust stains on the patio, and can become bent and unstable. Some types of metal patio furniture are coated with a type of rubber to help seal the metal from corrosion, but it makes for a sticky, grabby surface for sitting on or sliding across (like playing cards). Poly patio furniture is the best outdoor furniture option available today. 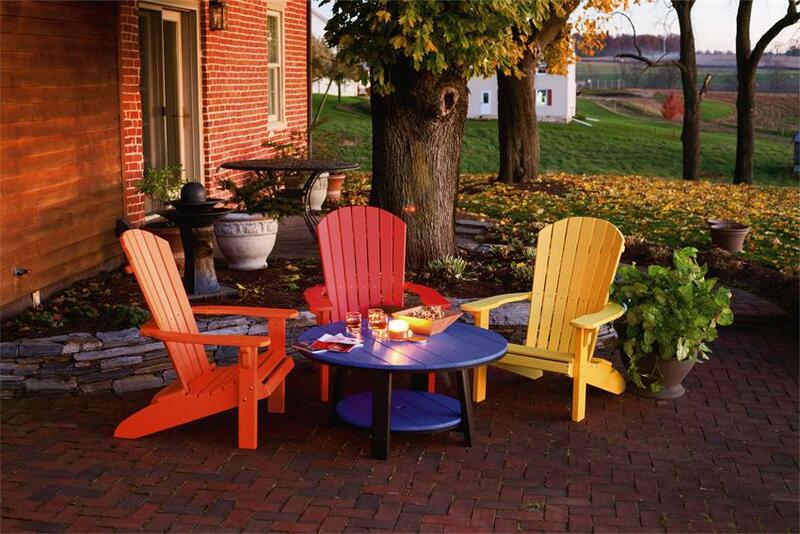 Polypropylene (poly) furniture is made from recycled plastics and can be made in many colors. This is an opportunity for businesses to customize the furniture they buy to match the color theme of the location they will be used in knowing that they won’t have any maintenance costs to deal with, and the furniture will always look “new”. The extremely dense material is very durable and scratch resistant. It never rots or fades in the sun, and when purchased from Salem Structures you can be assured it will be constructed with 100% stainless steel hardware to ensure a LIFETIME of use. Commercial patio furniture made from poly materials is the ultimate option in outdoor lawn furniture. Just about every major design style you have in mind can be accommodated. Some of the most popular are the Adirondack chairs, Rocker Gliders with ottomans, Chaise Lounges, and Porch Swings. There is also wide selection of square, round, and octagon shaped poly tables and end-tables. The pricing on commercial poly furniture is a little higher than the same furniture made from wood materials, but no other lawn furniture option comes with a lifetime warranty. If you need super durable furniture, and don’t want to ever paint or stain, our poly furniture manufacturers make what you’re looking for.